Contrary to popular belief, metabolic rate (the rate at which metabolism takes place) does not vary much between the majority of the population (Donahoo et al. 2004). However, there is a considerable amount of variability in the number of calories burned per day through non-exercise activity (Levine et al. 2006). What is non exercise activity thermogenesis (NEAT)? NEAT can be defined as everything we do that’s that is not sleeping, eating or sports-like exercise (Levine 2002). Therefore all physical activities other than intentional exercise like fidgeting, working, ambulating, and playing, fall into this category. Why is this important? NEAT varies between two people of similar size by up to 2000 kcal day because of people’s different occupations and leisure-time activities (Levine 2007). Even though NEAT is hard to measure, by becoming aware of it, you may start to recognize how certain amounts of food and training effect either you and/or your clients NEAT. You may also be able to better help them re-engineer their work, school, and home environments as well as make better informed decisions about you and/or your clients current or future programming. 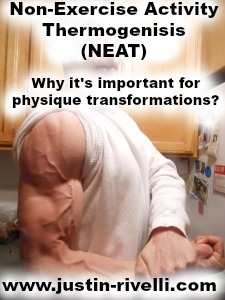 In sum, although many people are quick to judge their “metabolism” when it comes to reducing body fat, an enormous factor that gets left out of the energy balance equation is non exercise activity thermogenesis (NEAT).